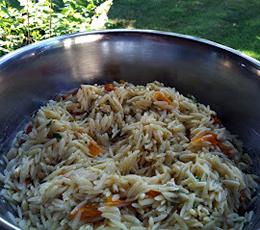 This orzo salad is about as simple and delicious as you can get, thanks to our Featured Foodie, A Couple in the Kitchen! Prepare the orzo according to package directions. When it is done, drain it and rinse it well with cold water. Add the remaining ingredients and stir to combine. Serve chilled or at room temperature.